For several months I’ve been on the once-a-month freezer meal cooking bandwagon. When I first learned about monthly cooking, many years ago, it seemed like the things people were freezing to eat later were chili, soup, chili, another tomato based product, and chili. Not being so adventurous in the kitchen, the idea of cooking once a month sounded awesome, but the offerings left me hesitant to try it out. And I’m sure I was missing out on great recipes back then, but so be it. Lately though, with everyone being more concerned about what they eat, the offerings of tastier and healthier freezer meals has exploded! And many smart people are gathering together these recipes and offering instructions on how to make them all at once to do the once-a-month cooking. I’m sold! If you’re new to monthly cooking, the premise is to make enough meals for a month, freeze them, and then pop one out to reheat/cook with minimal effort. Maybe throw together a side dish quickly, grab a couple of veggies, and dinner is served! It may take all day to cook, like in a crock pot, or minutes in a microwave. The thing is, you don’t have to fret over what to make each night, hoping you have ingredients in your fridge and pantry, and then hoping you have enough time and energy to stand in front of the stove. For my family’s lifestyle, here is what once-a-month cooking looks like. I go to Once A Month Meals (the site I’m currently using, although I know there are plenty of options out there) and choose the Whole Foods Menu of the month. It’s not the grocery chain, it’s filled with recipes made with natural/non processed foods. I pick the menus that I want and swap out the ones that either will take too much effort to prepare or that I don’t care to bother with (grilling when I know my husband won’t have time to turn on the grill). I swap these for other recipes that sound good to us. I head to the store with the grocery list (that the site already has built for me), with the proper proportions. I take one day to prep the food: chop the veggies, pre-make any stocks, cut up meat, etc. For the rest of the month I try to remember to create weekly menus. The food is already in the freezer, so if I don’t make a menu then I just pull something out. The hardest part for me still is remembering to pull out a meal a day in advance to let it thaw in the fridge. Sometimes this doesn’t matter if it’s a crock pot meal. Each week or two I’ll go to the grocery store to replenish our staples: fruits, veggies, milk, eggs, etc. Another option for monthly cooking that I have done several times is the Tastefully Simple freezer meal workshops. In one day you make ten meals using their products. All the recipes on the OAMM site and from Tastefully Simple are DELICIOUS. Gourmet delicious. The OAMM site gives you about 8 meals per monthly menu (you could add more if you want), and Tastefully Simple’s gives you about ten. When I first started doing the monthly cooking I wasn’t sure that would get us through a whole month. BUT IT DOES, and then some. We’re a family of four, and one of us doesn’t eat very much, so I am able to split most meals into two. So 8 meals automatically becomes 16. That’s still only half a month. Well, with how hectic our schedule is, we end up grabbing sandwiches at least once a week, eating out at least once a week, and then having breakfast for dinner or pizza. Add in leftovers and those meals actually do last us through the month. Sorry, I can’t make that prettier. Martha hasn’t offered to come help me organize and beautify my meals. 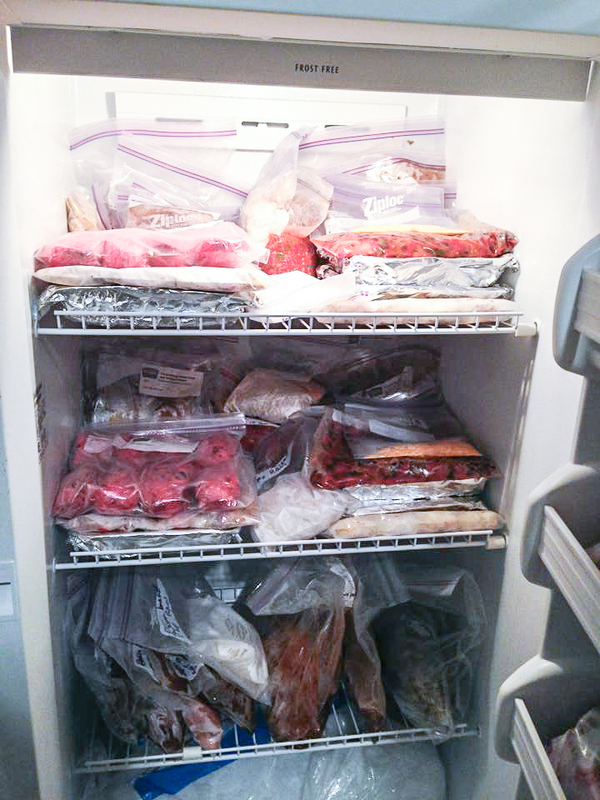 If you haven’t tried once-a-month or freezer cooking I would encourage you to give it a try! Go to Once A Month Meals or Tastefully Simple to see what they’ve got. OR, head to Pinterest and search for freezer meals. Just make sure you’ve eaten or else you’ll end up starving looking at all the delicious options. THEN, relax for the rest of the month, knowing you’ve got dinner covered. If you use a different site to plan your monthly meals, please let me know about it. I always love having more options. And they taste delicious! One of the de-stressers is that the menu comes with the grocery list in tact to it doesn’t take as long to plan.